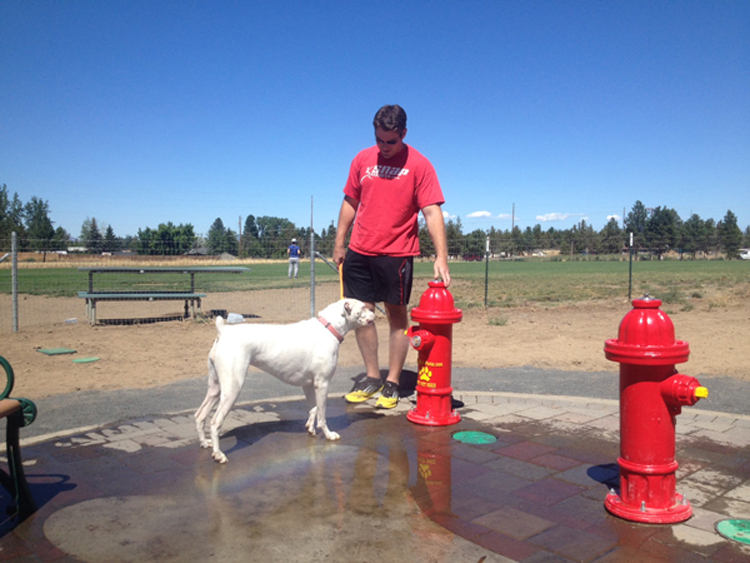 Bend’s dog population finally has a place to cool its paws with last week’s opening of the Bob Wenger Memorial Spray Park at Pine Nursery Park. The first water feature for dogs in the Bend Park and Recreation District, the spray park includes hydrant-shaped fountains to create a fun and cooling climate for canines. The project has been in the works for more than three years—since the death of beloved advocate for off-leash dog parksBob Wegner in January 2011. The well-known dog lover, who was an active volunteer on dog park projects, died from a heart attack while moving a boulder in Pine Nursery Park, Gifford says. She says Wenger was known for riding around with his dog, aptly named Rider, in the front basket of his bicycle. He also had skis custom-built for the dog, she adds, and had a special pass for him at Mt. Bachelor. And Wenger was the one who pushed for a water feature at the dog park. After his death, Wenger’s family started a fund and raised about $3,000 for the off-leash area. Initially, Gifford says, the community was pushing for something big, like a large pond, but they soon realized it would be too costly to build and maintain. So they focused on fundraising—bringing in more than $12,000 in all, between individual donations, DogPAC funds and money from the Bend Park and Recreation Foundation—and scaled back the scope of the project to something more manageable. But Wenger inspired more than just water features, Taylor says. Wenger took on a personal role with the off-leash areas, with a hand in everything from planning to implementation. The feature is located within the off-leash area in the Pine Nursery dog park that Wenger poured so much of his time and energy into. But Taylor emphasized that the spray park is for dogs only, and is not a suitable play area for children. She points out that children can cool off at Juniper Swim and Fitness Center, which has multiple outdoor water features. While the Bob Wenger Spray Park is currently the only water feature for dogs in the district, Taylor says it could be the start of a trend. Also in the works at Pine Nursery is an off-leash area specifically for small dogs. Taylor says Bend Park and Rec received numerous requests for the small dog park, currently under construction and due to open this fall. There are also size-restricted parks at Riverbend and Ponderosa parks. Taylor says that while the small dog park was not started in direct response to the April killing of a small Papillion by a larger American Bulldog at Pine Nursery, that incident may have sped up the process. “It may have inspired people to ask, ‘How soon can we make this go forward? '” Taylor says. Next Can A Mormon and Republican De-Throne Governor Kitzhaber?